Happy Monday people! I'm excited because over the next 3 days, we'll be introducing you to 2 awesome stamp sets and 3 new color options from Avery Elle! The new colors to add to your stash are Cherry (a lovely red), New Moon (true black), and...wait for it...Fog (gray! feel free to fist pump;). And today we're all featuring projects using the new set "Fanfare"! Let's get to it, shall we? There are so many cute images in this set, but I was drawn to the long background builder stamp. So many possibilities! I saw waves, fish scales, clouds, and...Christmas trees! 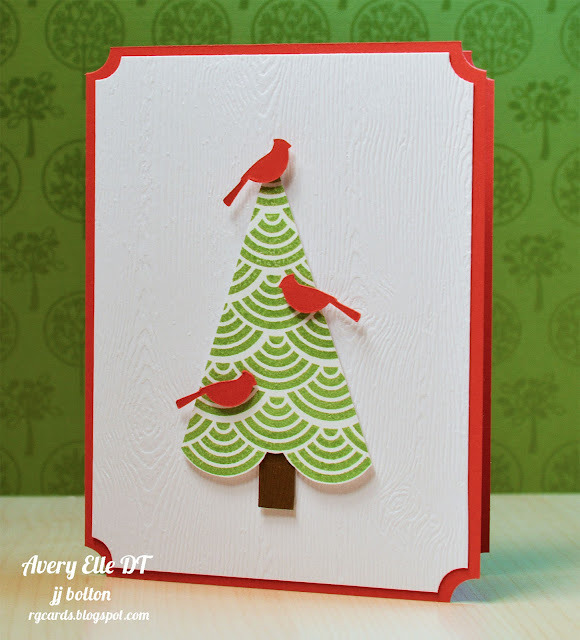 For my first tree card, I hand cut the tree and popped it up on to the card. I added a few cardinals that I cut out with my Silhouette, but you could also try embellishing with ribbon bows, gems, or sequins. Nice and CAS (great if you need to make multiples;). For my last Fanfare card, I used the same stamp with a completely different look! I heat embossed the stamp in white and blended a rainbow over it! It's almost therapeutic to blend ink like this:) Messy but lots of fun! That's it for me today! Click on over to see more projects from Jamie, Heather, Kasia, and Chunyuan! And don't forget, Jamie is offering the chance to win a $25 store credit! All the details are on the Avery Elle blog so click over! 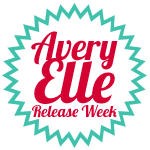 The new release items will be available to purchase on October 3rd on the Avery Elle site! ...sigh...I soooooo love your style! Wow, these are so pretty, JJ. I really like the negative cut tag. (I have the Beads in a Bottle that I think I need to take out and use). These are fabulous. Love the negative cut as well! First of all, I love how you used that background builder stamp ... you really worked it! The trees are just perfect for that, who knew?! And secondly, speaking of trees, I was in Barnes and Noble this wkd and saw your stripe Christmas tree in the PC Christmas special. WOAH, I. LOVE. IT. So super stunning, but simple to create once you see the idea. Fantastic, JJ! How fun is that rainbow card, love it! LOVE the tree! You are a master! Gorgeous. 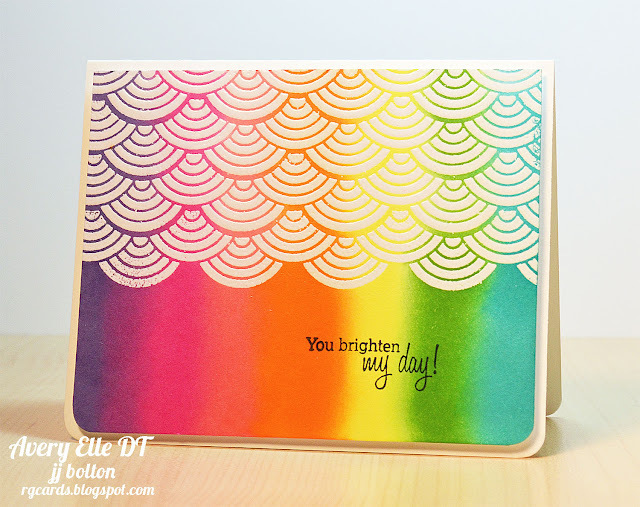 love love the rainbow color embossed card. I want to be like you when I grow up. LOL! These are breathtaking! Wowza! Fabulous projects!! 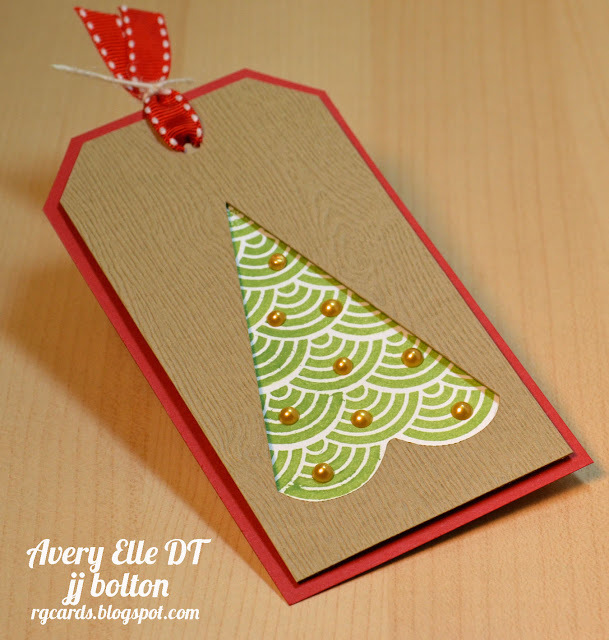 Love the tag and that incredible emboss resist! I LOVE how you can see so much potential in patterns & designs! The trees? Fab! (Must look for the Tulip stuff...yes!) And you KNOW how much I love that rainbow card....Awesome! All three are fabulous, thanks for the gorgeous eye candy! Beautiful cards JJ! Oh! And congrats on your big win on the TAWS blog! Goodness, you are so creative! What a stunning display for that particular stamp in the set. Fabulous cards as always and a wonderful showcase of the new fan border--love it! Three beautiful cards! I am in love with the trees! Very clever! Gorgeous inking! Love it! Great idea to use it for a tree too! I love the Christmas trees! Your rainbow card is gorgeous, too - I love them all. 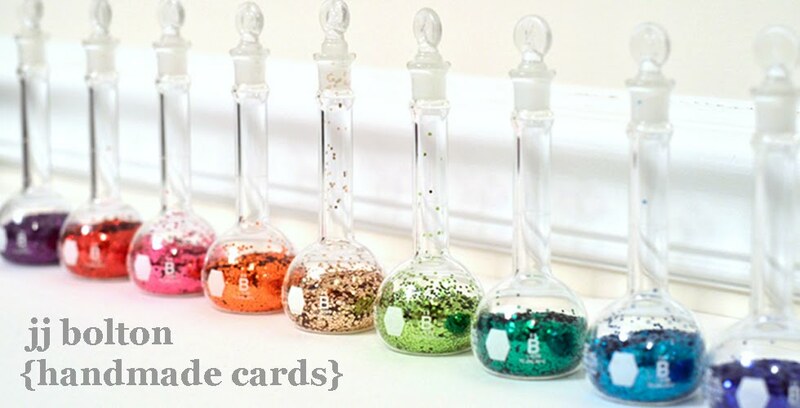 I have those Beads in a Bottle and I forget to use them, they look so pretty on that tag. JJ those trees are so adorable! Your rainbow card is absolutely stunning. You cards always pack a WOW! Your trees rock and I love that Beads in a Bottle paint. Never heard of it before but am going to have to check it out... And your blended rainbow is gorgeous! So cheery!